I found on my red 5S that the aluminum radiator petcock has been welded or sealed over, where you typically let the water out. So I was thinking of getting the car on a lift and emptying the fluid from the middle pipes near the center. Anyone have experience or tips for doing this? I could imagine the hose may be hard to remove as it may be stuck on due to time and heat. Thanks. I have luck cutting off the offending rubber hose -- just make sure you have the replacement on hand. Who would want to reuse a stiff noncompliant one anyway? HUGE HINT use a new sharp razor in a utility knife; works for me every time. What kind of fluid are you planning on using for the fluid change? Seems like the premixed Extended Life Coolant (ELC) is the way to go in the research that I have done; the ELC is the red stuff. There is no buildup on the radiator core over time, and the stuff is supposed to last years without loosing the rust inhibitors; unlike the green stuff. It is also compatible with all metals. You just have to make sure that you flush the system good to get all of the other stuff out. Thanks Mark. I have used something called Dex-Cool in the past, it is orange & says good on aluminum parts and says it lasts 5 years. Maybe thats the same stuff? I am trying to think how to do this with minumal rain on myself and the carpet garage. I was thinking of drilling a hole in the hose before cutting it, so at least hopefully it all falls straight down out the hole. You just have to make sure that you flush the system good to get all of the other stuff out. Not true. They are compatible, but the standard green will compromise some of the effectiveness of the red. Maybe that's the same stuff? Before switching to the red (Dex-Cool) you may want to do some Google searching. There were several class-action suits on the early GM use of Dex-Cool as they put it into vehicles that had incompatible gaskets. On top of that issue, when it is exposed to air it will create a precipitate (black, gunky slime) that is not nice to have swirling around in your cooling system. Test this yourself by checking your late model GM vehicle. See a funny discoloration in the overflow tank, or under the pressure cap? Yes, I know there is not supposed to be air in a cooling system, but what should be and what is are often not the same. Again, if thinking of switching to the red, I'd arm myself with some Google info. I did, and I'm thinking of switching back to the green on our 2001 Astro. Take a drill bit (1/4"?) and chuck it in the drill. Cut a short piece (~1/4") of rubber tubing that is the same ID as the drill bit and place it over the drill bit. Slide it down until it touches the jaws of the chuck. Take a plastic bowl and drill a hole in the bottom with this drill. Don't tell the wife. Leave the bowl on the drill bit and slide it down until it touches the rubber tubing. Cut another piece of the same size tubing and slide it all the way down the drill bit until it touches the bowl. Hold the bowl from turning (or not) and drill your hole in the coolant hose. Before you drill the hole, make sure that the coolant cap was not removed since the last time the engine was started and do not open any part of the coolant system. This will actually cause a slight vacuum in the system and will help to reduce the initial "piercing" mess. Once you have drilled the hole and have the catch bucket in place, remove the coolant cap. 1. Spread a plastic tarp. A kid's wading pool works great. 2. Make sure the coolant is cool. 3. Use a cordless drill, not a 120 volt plug-in drill. I just had to add #2 & 3. When you are ready to install the new hose, mark the hose-to-coolant tube overlap on each coolant tube with a felt pen. That way you can easily find the correct installed position for the hose. If the hose is a tight fit on the coolant tube, apply a thin film of silicone spray or Vaseline to the coolant tube. Thanks for all the tips on changing the coolant from the pipes, and also on that Dex Cool stuff. Google did show all kinds of bad stuff about it, and I thought it was the best stuff! The ELC coolant is good stuff; we have it in all of our Cat equipment -- and using it day in and day out does not form any white deposit crap on the radiator tubes. Our radiators die because of sandblasting -- this should not be a problem with a Pantera, unless you are traveling across the Sahara or other sandy, windblown locales. Just been our experience. ELC (extended life coolant) also has a wonderful corrosion additive that lasts a really long time (500,000 miles or some crazy high number). There is another product out there that racers use and have really good luck with it. Of course, the only trouble that I am aware with it, unless someone else knows their stuff about this firsthand, is that is is terrible expensive. Like $40 per gallon -- yes, you heard correct. It is a waterless coolant that has a very high boiling point (370 degrees fahrenheit) that does not require any pressure to operate. It is better to keep the engine from detonating, it allows a smaller radiator because it is more efficient, and there is no water in the stuff to boil off, so no topping off is needed. From their website, looks like it is compatible with all kinds of metals too. My only question with this stuff is, how long does it last, and is there any negatives that go along with this stuff other than the price? What the heck Mark, google does show all kinds of warnings about that Dex-Cool stuff. I have Dex-Cool approved Prestone, probably the same stuff. Mark C showed me an easy solution. I have silicone hoses and all I have to do is loosen the clamps, put a big flat drain pan underneath and wiggle the hoses loose. They slide right off, no problem. It's also the best place to drain from as it's the lowest point on the car - lower than the rad. After draining I just slide the silicone hoses back on and retighten the clamps. Been doing this for years. Catch you later and GOOD LUCK!!!! Good luck Jan! Seems like ever time I take this on (which seems to be more often lately) I can never help but make a huge mess. Might want to keep a few old towels on hand just in case . Thanks for the clarification & weblink Mark, it looks like that ELC is the way to go. Now just need to get some of that and wait a little for my back to get better as getting under the lift sure won't be fun till my back pain is gone. Those silicone hoses may need a look see as well, sounds like easy on easy off, other than the green or white stripe hose which seems to glue itself on and need to cut it off...although cuting and putting new may help too. However if I get the ELC stuff, I may never need to change the fluid again as infrequent as I drive the cars (once every 1 -2 weeks). Something else that you might consider (after the coolant is drained) is to weld pipe fittings onto both of the coolant tubes and install a drain valve or pipe plug. Cutting a pipe coupling in half will give you two weld fittings and will reduce the distance that it sticks out from the coolant tube. Do this on the forward most tube (the one that bends up toward the radiator), as there is more working room in that area. This won't help you now, but it will in the future. Well after several months, I am finally revisiting this since my back is now better and can get under the car to change the fluid. Now I just need to get the fluid. 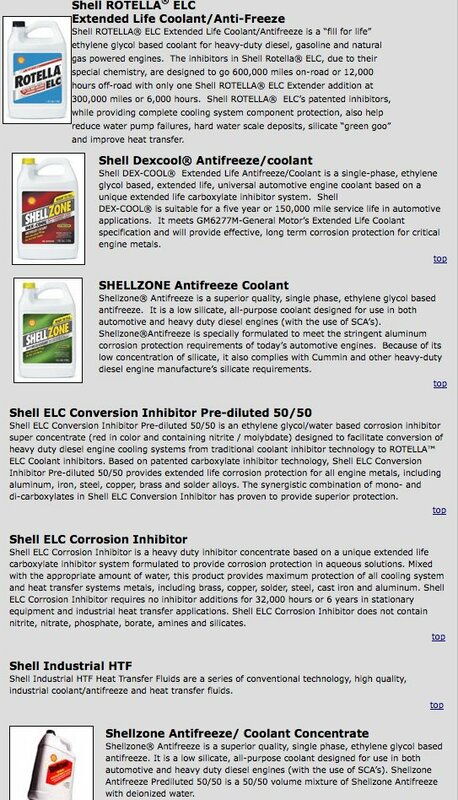 The Shell Rotella ELC red stuff that Mark mentions seems like good stuff. I have been using the Pestone orange stuff in the past with good luck though (photo). This would be for the red 5S with aluminum engine and radiator, so I am looking for something good with aluminum parts. Something owners of mostly-aluminum cooling systems should look for is antifreeze that says 'low silicate'. Know that for decades, Prestone and others added small amounts of silicate grinding compounds to antifreezes to scour scale out of engines and brass radiators. The abrasives also shorten waterpump seal life and erode thin aluminum heater cores and radiators. In the '90s, Honda began marketing an 'extended-life' low-silicate antifreeze for their all-aluminum water-cooled motorcycles and car engines, and now there are others. Caterpillar Tractors did a study on long-haul trucks and found the low-silicate coolants extended engine life. But not all 'extended-life' antifreeze is low silicate, so look closely at the labels. This first Prestone doesn't look bad either in this link below...says it's extended life and says no silicate on the label that I looked at, and not that DEXCOOL crap. At least my local Kragen has the Prestone, and although they sell the DEXCOOL, they advised against it, saying it was really only for ceramic coated applications. Finished the dirty deed yesterday just going with the Prestone extended life coolant. Actually it wasn't too bad. Since my Fluidine doesn't have a lower petcock, I just inserted a plastic wedge between the hose and pipe connection under the car until the fluid came out (that way I didn't have to monkey getting that old hose off as the hose was still good). Before I did all this though, I drained and cleaned the overflow tank as it had rusty color water in it. This was quite different color than what came out of the main fluid pipe under the car. Maybe because the coolant overflow tank can rust some on the inside? I would think that water would be recirculating in the system from the overflow, but apparently not due to the different water color I saw. Anyway, for those who just drain and then refil without flushing the entire system, maybe consider trying to dran and clean the overflow tank before refilling the system. Maybe because the coolant overflow tank can rust some on the inside? I would think that water would be recirculating in the system from the overflow, but apparently not due to the different water color I saw. Water & overflow tanks from mid-'72-up were nickel-plated inside and out, then spray-painted flat black- maybe for slightly more heat radiation. If you remove the paint, you'll have a nice shiny stock tank. But plating is never a continuous sheet. Instead, its a stack of flat crystals, and its very possible for water to wormhole its way under the plating just as on an old bumper. If coolant isn't changed yearly, the corrosion inhibitors get used up and rust starts on the underlying mild steel. I've seen stock tanks with NO bottom and one with a soldered-on coffee can bottom! Also, the out-pipe is not at the bottom of the tank, so even though there is (or should be!) circulation, stuff still collects in the bottom. The best coolant additive that I have found is No Rosion Hyperkuhl. It dropped the operating temperatures 10-12 degrees as well as provide 100% corrosion protection in my panteras. Make sure to check the FAQ pages. There is a lot to be learned from it. If you don't need the freezing temperature protection, you can run plain tap water with this product and have 100% corrosion protection and the best thermal transfer cooling possible. If you need the antifreeze protection, you can add it to any antifreeze for added thermal and corrosion protection. This is a small family owned company that makes a quality product that is used by NASA to cool the launching pads and also to cool nuclear reactors. I liked the product so much that I became a distributor. I liked the product so much that I became a distributor. Does this mean that Pantera owners get a discount? Extended life antifreeze most commonly known as Dexcool was developed for modern aluminum block/headed engines. Old glycol antifreeze contained silicates which are abrasive. I believe they are added to wear away scale from iron engine parts. Unfortunately they wear away rubber seals and soft aluminum parts. Water pump failure is usually attributed to seal failure leaks. The drawback to Dexcool is that when contaminated, it turns into a gel. I have seen a neglected system's resevoir coolant turn to brown pudding that has to be spooned out. Look at your radiator cap seal, if it has a brown gel forming, that's the start of it. As was said, there are class actions law suits causing overheating damage when clogging cooling systems. Adding Dexcool to a system that didn't come with it unless it's a totally cleaned out (like new) is not a good idea. If there is ANY contaminants in the old system, it will immediately start to deteriorate and break down. If you were using a glycol mix, you should continue. I found Hyperkuhl which provides 100% corrosion protection and water wetter in one, seemed like the perfect product. Plain water is the best coolant, it has twice the heat transfer of glycol based anti freeze and 50% better than a 50/50 mix. Living in the tropics, I didn't need antifreeze protection and ran plain water with Hyperkuhl, my cars ran 10-12 degrees cooler than with plain water. This product is great with mixed metals such as iron engine blocks with aluminum heads and radiators. Unlike sacrificial annodes which offer localized protection, Hyperkuhl offers protection throughout the system. There are zinc anodes sold which advertise cooling system protection, some sold integrated into radiator caps. These are bogus as zinc protects in salt water thus are used in the marine industry. What protects in fresh water is magnesium. When I was in high school, the old time racers that I hung around with used to grind magnesium into powder and mixed them into the cooling systems. When left sitting, Hyperkuhl bottles had a silver colored sediment on the bottom of the bottles. While the formula is secret, I suspect that the substance is magnesium. The company lists an active ingredient as Molyb which is supposedly expensive. Fluidyne used to recommend Hyperkuhl for their radiators, not sure if they still do. Hyperkuhl has the same life span and Extended Life Coolants. If freeze protection is needed, it can be added and will provide added corrosion protection. How good is this stuff? It's used on NASA launching pads and to cool nuclear reactors. I would offer a discount but the double shipping (from manufacturer to me to you) would probably negate any savings that I can give you. It's probably best to order direct from the manufacturer (www.norosion.com) Anyone in Las Vegas is welcome to contact me for discounted prices. I recommend the Hyperkuhl, superflush, and Oil Passivator.